Well, today is once again Tell A Story Day, but unfortunately, I didn’t remember in time to come up with a story, so I’m resharing this one from last year. So, I found out a couple of days ago that today is Tell A Story Day. I had been playing around with the idea for a story the last few days, so I decided to use it for Tell A Story Day and share it here and treat you all to a BRAND NEW story featuring my mercenary sorceress character, Marissa Cobalt (star of Kismet and Tell and Chronicles of Riss)! Enjoy! Sunlight glinted on the blue water of the Incara Ocean. The day was beautiful, bright and sunny. There was a light warm breeze that blew my long blue hair into my face, but I didn’t mind. I just stood at the railing of the ship and stared out at the water. I’d never seen the ocean before, and my fourteen-year-old self couldn’t get enough of the sight. Categories: general, Uncategorized, writing | Tags: Adventures in Sorcery, fantasy, Marissa Cobalt, reblog, short story, Tell A Story Day, writing | Permalink. 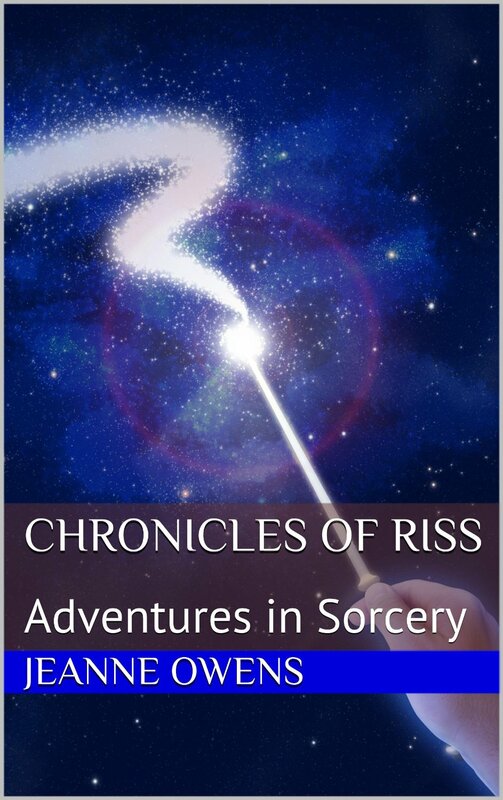 Early Black Friday Sale – Get My Book, Chronicles of Riss, For Only 99 Cents! Join the young mercenary sorceress Marissa “Riss” Cobalt as she recounts some of her early escapades, such as confronting evil sorcerers, searching for treasure, dueling metal golems, finding a stolen show dog, and more. I’m kicking off the holiday shopping season with my own “Black Friday” sale! Escape the hectic chaos of the Thanksgiving holiday with some fun, fantasy, magic, and mayhem, or get the book as a present for someone you know who’d like it. Chronicles of Riss will be on sale all week, so you have plenty of time. I will keep it at the $0.99 sale price through Cyber Monday (11/28/2016). Get Chronicles of Riss on Amazon here. Get Kismet and Tell on Amazon here (it’s also available in paperback). Categories: books, general, publishing, Uncategorized, writing | Tags: 99 cents, Adventures in Sorcery, Black Friday, blog post, books, Chronicles of Riss, ebook, fantasy, publishing, sale, shopping, writing | Permalink. Sailors and other passengers came and went along the deck behind me, but they wisely didn’t bother me. We’d only be at sea a few days, but everyone had already learned not to anger me. “Are you ready to go, Marissa?” my teacher, the sorcerer Althor, asked from beside the front door of the tower we called home. “Coming!” I crammed the last bite of sandwich into my mouth, picked up my travel bag from the floor, and hurried out of the kitchen as Aster gave a small mew from the table. There was bright flash of white light, and then the tower was gone and we found ourselves standing in front of a small house at the edge of a little village. A pretty middle-aged woman with long brown hair ran out of the house, followed closely by a tall, middle-aged man with shaggy black hair. “Marissa!”the lady called as she ran up to me. She knelt and gave me a tight hug. The man stood behind her and stared down at me with a big smile on his face. My mother finally released me, then took a closer look at me. “What did you do to your hair?” she asked in surprise. “I..uh…I had a little accident,” I said sheepishly. “An accident?” my father asked. “It looks very nice,” my father said, though I didn’t think he really meant it. “Uh, well, maybe just a quick drink,” he said, trying to hide his embarrassment. Althor didn’t stay long. He only had one drink with my parents before excusing himself. He was not a very sociable person, after all, and listening to my parents talk about how pleased they were with my progress in studying magic seemed to embarrass him, which he tried to hide with a gruffer than normal attitude. When he left, he made sure to remind me to return to him promptly in a week, after checking that I knew how to do the Teleport spell correctly. The next few days at home with my parents went by quickly. I had a fun time visiting. I enjoyed catching up with my friends in the village. Well, the few I had managed to make, anyway. Even as a child, I was known to be a bit…temperamental. It was also Solstice Fest time, so the village was decorated for the festival with colorful streamers strung from building to building across the village center, and wreaths hanging on all the doors. Even the tree at the center of the village had been brightly decorated. There was a chilly nip in the air as everyone gathered at the village center to celebrate and exchange gifts, but there was no snow this time. My parents gave me a beautiful blond doll as my Solstice Fest gift, which I loved. As the end of my visit drew near, things took a turn for the worst. It was a couple of days after Solstice Fest, and the evening before I was to return to Althor. I had finished packing my travel bag and had gone to bed when it happened. I was just about to doze off into sleep when I heard yelling and screaming from outside the house. I sat up in bed, called for my mother and father, and tried to make sense of what I was hearing outside. Getting no response, I slid out of bed and crept to the front of the house. The door was open and there was no sign of my parents inside, so I peered out the door into the growing darkness of evening. What I saw rooted me to the spot. A least a dozen bandits filled the street, laughing madly as they rounded up the families from the houses next to mine and from across the street. Some bandits held the villagers at weapon-point while a few other bandits went into the houses. My parents were standing at the edge of the street, facing a couple of bandits who pointed swords at them and were trying to make them kneel, but my parents were refusing to back down and let them into our home. One of the bandits frowned and said something I couldn’t make out. The next thing I knew, their swords seemed to move in a flash, and then my parents dropped to the ground. In my anger, I had made a mistake. I was so angry, I hadn’t focused my energy correctly with the spell. Plus, I had only just recently begun to learn the spell and so I hadn’t perfected it yet. So, I sort of made the Fireball a little too powerful. The Fireball also overshot its target and ended up landing in the middle of the street before it exploded. The resulting explosion wiped out the bandits…along with the villagers who were in the street with them, and destroyed all the houses at that end of the village. The explosion also sent me flying, backwards and away from the unintended destruction. Needless to say, the rest of the village wasn’t too happy with me. Sure, they were glad to have been spared being raided by bandits, but losing part of the village didn’t sit too well with them. So they exiled me, even though I apologized profusely and even offered to help rebuild. They just didn’t want to take a chance on me losing my temper like that again. Heartbroken at the loss of my parents and my hometown, I used the Teleport spell to return to Althor. I stood staring at the front door of the tower for a while after the spell dropped me off there. I didn’t know what to say to Althor. How was I going to tell him what had happened? How could I face him? He would be upset with me for using a spell I hadn’t perfected yet like I had. Would he understand my anger at the bandits, and would he accept that I was sorry for what had happened as a result of my wayward spell? Would he continue to keep me on as his student? Because I really did want to keep learning magic. I wanted to learn all I could, in honor of my parents, who had been so proud of me. And I also wanted to learn more so I could eventually strike out on my own and fight the evils of the world, like those bandits. Taking a deep breath, I finally reached out and placed my palm against the door. A pale blue light surrounded my hand briefly as the wards on the door lowered. Then I grasped the door handle and pushed the door open. I stepped inside to learn my fate with Althor. As he left, I turned back to take another look at the ocean. A lot had happened in the six years since that incident. But I had learned all I could from Althor, and now I was finally on my own and ready to make my own way in the world. Evildoers, beware! Marissa Cobalt is coming for you! I turned from the ocean and headed back to my room to get ready for dinner. Categories: books, general, Uncategorized, writing | Tags: Adventures in Sorcery, blog post, books, fantasy, Marissa Cobalt, prequel, story, Tell A Story Day, writing | Permalink. Chronicles of Riss, the short story collection “prequel” to my book Kismet and Tell, is now available! Confronting evil sorcerers. Fighting monsters. Dueling metal golems. Searching for a sea monster. Hunting lost treasure. Finding a missing show dog. Competing in talent contests. Helping lost children. These are just some of the widely varied exploits that the young mercenary sorceress Marissa “Riss” Cobalt shares in this secondAdventures in Sorcery book. Riss reveals how she ended up as a mercenary and chronicles some of the many adventures, ranging from fun to serious, that she’s had prior to the events of Kismet and Tell. Categories: books, general, publishing, Uncategorized | Tags: Adventures in Sorcery, announcement, blog post, book, Chronicles of Riss, fantasy, Jeanne Owens, Kismet and Tell, Marissa Cobalt, official, release, Riss, young adult | Permalink.